On the surface, choosing a Twitter handle for your business seems like a pretty straightforward process. Just head over to Twitter, sign up and use your company name. That simple, right? If any of those sound familiar, don’t worry. It’s not the end of the world. With a little creativity, negotiation and planning, you can get the perfect Twitter handle for your business. Some people use the terms Twitter handle, username and name interchangeably. Your Twitter handle and username are the same thing. They’re what comes after the “@” sign and appears in your profile URL. It’s unique to your account, and no two are the same. Your name on the other hand, does not have to be unique. It’s what helps people find the people and businesses they’re looking for, even if they don’t know your Twitter handle. As long as your company’s name is less than 20 characters long, you’ll always be able to use it as your Twitter name. Your username/handle is another story. What Makes a Good Twitter Handle? Before we get into the more complex issues that come up when you’re choosing your Twitter handle, let’s go over some of the best practices. Use your business name: You should always use your business name if it’s available. Avoid numbers: When your business name is taken, Twitter will usually suggest adding one or more numbers on the end. Don’t do it. We’ll give you some better alternatives later. No underscores: If your company name consists of multiple words, don’t use underscores to separate them. Make it all into one word if you can. Be consistent: Try to keep your Twitter handle consistent with your other social media profiles. It’s better for branding and helps people easily identify your company across every social network. Short and simple: Make your handle as short as possible. Long complex Twitter usernames are easy to forget. Don’t keyword stuff: Some companies try to sneak keywords into their handle to help show up in Twitter search. This can get spammy really quickly, so tread lightly. Only use “The Real” if you’re verified: You’ve probably seen Twitter handles such as @TheRealStanLee. Unfortunately there are so many fake and fan-made accounts that using “the real” tactic has lost some of its effectiveness. People no longer automatically associate “the real” with official brand accounts. You can make it more authentic by having your account verified. Don’t substitute letters: Swapping out a “1” for a lowercase “l” or using a zero instead of an “o” aren’t good ideas. It can confuse people when trying to find your brand on Twitter. Now that you know the basics, let’s talk about some of the tricky situations that you might run into when choosing a Twitter handle. This is easily the most common issue companies run into when choosing a Twitter handle. Since Twitter has been around for years, a lot of people have started accounts and abandoned them. Unfortunately that makes their handles unavailable for new users. There are also people called squatters that sign up for multiple accounts to take Twitter handles they believe have value. They have no intent on using the account, but they hope someone will need the handle at some point and be willing to pay for it. Although Twitter prohibits username squatting, it’s still pretty common. When your company’s Twitter handle is taken, it can be a headache to deal with. Fortunately you have options outside of throwing arbitrary numbers and letters at the end of your username. This won’t be an option for existing businesses, but it’s something new companies should consider. Before the days of the internet, naming your company was as simple as making sure the business name wasn’t already registered in your area. Now you have to check to make sure the domain name and social media usernames are available too. 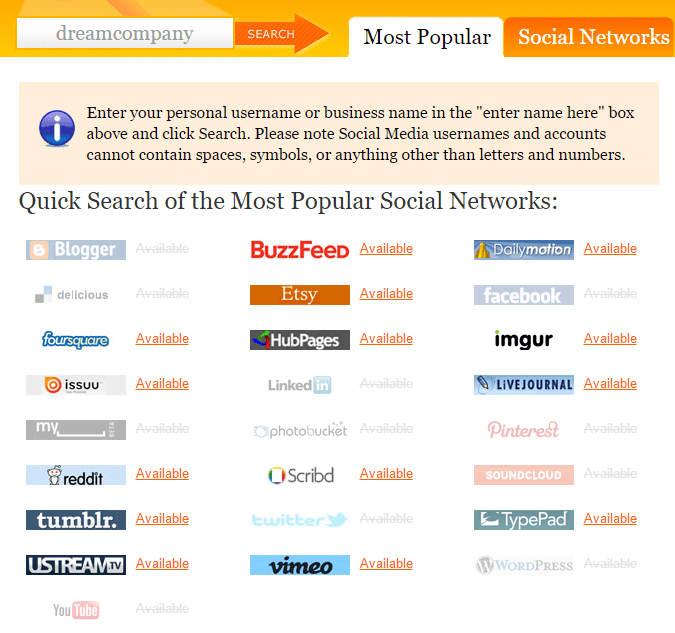 Before deciding to name your company, do a check on Knowem.com or similar tools. If the handle is available, grab it. If not, think of an alternative name or shortened version of your business name. Most brands assume that if a Twitter handle is taken, there’s no way to get it. However, it could be as simple as just asking the current owner if you can have it. Although some squatters will ask for money, others will willingly give you the handle if they aren’t using it. The problem is it can be difficult to contact them if they’re inactive. You won’t be able to send them a DM unless they’re following you. One way to get around this is to follow them. If they have notifications setup, they’ll get an email or notification through the Twitter app. Hopefully, you’ll be able to get a hold of them and take over the handle. However, that’s not always the case. In 2013, the New Orleans Hornets NBA team switch their name to the Pelicans. However, the original user of @Pelicans refused to sell it for the mere fact she loved pelicans. The franchise eventually gave up and settled on @PelicansNBA. We’ll warn you ahead of time, buying and selling handles is against Twitter’s rules. So if you’re attempting to do shady backdoor deals, you risk getting your account suspended or being scammed. However, there have been instances of companies that have legitimately purchased handles from other users. The most popular examples are CNN’s purchase of @CNNbrk and the state of Israel’s purchase of @Israel. The difference between these two cases and the ones you don’t hear about is Twitter was reportedly involved in these sales. If you’re interested in buying a handle that’s taken, reach out to Twitter instead of taking it into your own hands. If you have a trademark on your company name, it may be possible for you to get the associated Twitter handle. However, it’s not as simple as sending Twitter an email saying you have a trademark. Twitter’s trademark violation policy is primarily for preventing people from deceiving and misleading other users. So if an active user just happens to be using the Twitter handle associated with your business name and doesn’t mention your products or services, it may not go in your favor. Using another’s trademark in a way that has nothing to do with the product or service for which the trademark was granted is not a violation of Twitter’s trademark policy. If you feel you have a valid claim, you’ll have to submit the following information to Twitter using this form. Getting a Twitter handle that’s been taken isn’t easy, but it’s possible. If your company’s Twitter handle is taken and you don’t want to go through the hassle of claiming it, you can come up with alternatives. We showed the Stan Lee example earlier, but there are plenty of other ways to get good Twitter handles if your brand name is taken. Adding HQ to the end of your Twitter handle is great because it’s short and simple. When people search your name, they’ll be more inclined to click the HQ version with your logo. Putting your city, state or country in your Twitter handle lets customers know where you’re located and is the perfect solution for companies with multiple locations. A popular trend for apps is to tack on the word “app” after the Twitter handle. The same tactic works for other industries as well. Just remember to keep your handle short and sweet. Have you ever thought about turning your Twitter handle into a call to action? If you sell a physical or digital product, adding “get” to the beginning of your handle is a good way to entice people to click through to your site. This tactic is popular among doctors, lawyers and health professionals that have special degrees or certifications. For instance, dentists often add DDS to their handle. Give any of these Twitter handle hacks a try if your company’s username is taken. Does your company manage multiple Twitter accounts for different aspects of the business? For instance, UPS has more than a dozen Twitter handles including one for social customer service and individual accounts for the various territories they serve. Juggling all of those handles is virtually impossible to do within the Twitter app. That’s why you need a Twitter management tool to serve as a central hub for all your Twitter accounts. 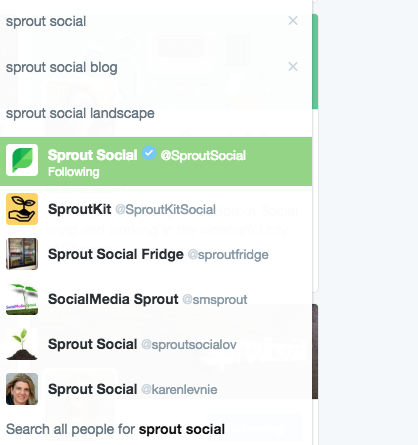 Sprout makes it easy for your team to Tweet from any of your connected Twitter accounts. You can even allow team members access to specific handles. For instance, you may want the HR staff to be able to use your Twitter handle for careers, but not customer support. That makes it easier for your team to stay organized and focus on tasks relevant to them. You may not always find the exact handle you want. However, using the tips and tricks you’ve learned above, you can still find some of the best Twitter handles available. Did you have to get creative to find your Twitter handle? Leave a comment and share your top tips!